In its ninth year of production and four years removed from its last significant overhaul, the Cadillac CTS-V remains virtually unchanged for 2013, save for a change to make automatic wipers standard equipment. The 2013 Cadillac CTS-V is available as a rear-wheel-drive 5-passenger sedan or wagon. The engine for both trim levels is a 6.2-liter supercharged 16-valve LSA V8 that makes 556 hp and 551 lb-ft of torque. The CTS-V comes equipped with a 6-speed manual transmission with overdrive and runs on regular gas. A 6-speed automatic transmission is available as an upgrade. According to the EPA, the CTS-V is capable of 14 mpg city/19 highway. For those concerned about cargo space, the CTS-V wagon offers 58 cubic feet of storage space. As far as standard amenities are concerned, the 2013 Cadillac CTS-V is loaded with them, including keyless access and start, cruise control, heated front seats, a leather-wrapped steering wheel, heated exterior mirrors, HID headlights with adaptive forward lighting, a 10-speaker Bose audio system with navigation and surround sound, 8-inch display screen, 40GB hard drive, AM/FM stereo with CD player and MP3 playback, Sirius XM satellite radio and 19-inch painted aluminum wheels. A power liftgate is standard equipment for the CTS-V wagon. Upgradable options for the CTS-V include Recaro performance seats that are heated and ventilated, a power sunroof, suede-covered steering wheel and shift knob, and 19-inch high-polished aluminum or satin graphite wheels. Numerous safety and security features are standard equipment for the 2013 Cadillac CTS-V, including dual-stage front airbags for driver and front passenger, front side-impact airbags, front and rear outboard head curtain airbags, Brembo 4-wheel antilock disc brakes, daytime running lights, fog lamps, a rear-view camera, rear park assist, electronic stability control, traction control, tire pressure monitoring system and a theft-deterrent alarm. Competition is tight in the upscale midsize sedan market, which includes the Audi A4, BMW 3 Series, Lexus IS and Mercedes-Benz C-Class. While the 2013 Cadillac CTS-V remains virtually unchanged, that is not necessarily a bad thing. The 2012 version received high marks for its styling cues, above-average handling and powerful engine. The 2013 version should be more than capable of continuing this tradition. 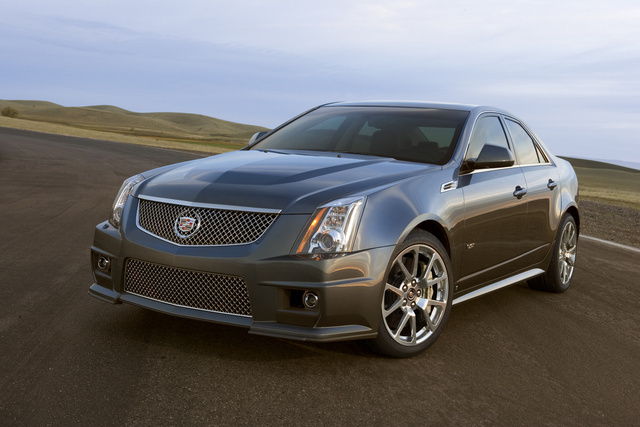 What's your take on the 2013 Cadillac CTS-V? Have you driven a 2013 Cadillac CTS-V?